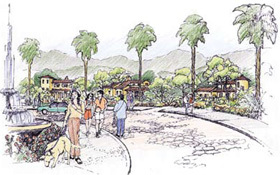 The community landscaping in Aloravita will resemble the character of the area. Trees will line arterial and commuter roads, thus beautifying the area. Streetscapes for neighborhood and local streets will be landscaped to shade the sidewalks and include shrubbery that will enhance the natural look of the desert and provide shelter for local fauna. All landscape buffers and landscape tracts within Aloravita are to be landscaped. Landscape buffers and the areas between streets and sidewalks and/or homes. Landscape tracts are areas outside of the public right-of-way intended solely for landscaping. Landscaped tracts and landscaped buffers may include lighting, misters, retention basins, shading structures, drainage corridors, fountains, signs and monuments. Preview the Aloravita tree landscaping plans. The trails system in Aloravita connects the northern parcel and southern parcel, allowing residents and guests to access the mountains on the northern parcel or access elementary schools located on the southern parcel. The trails system provides a beautiful environment for Aloravita residents outdoor exercise and activities. The trails will be composed of sidewalks throughout the main community and decomposed granite in areas along hillsides, washes and throughout other open spaces. The trails system throughout Aloravita will all be public trails. See the Aloravita trails system. Aloravita parks will contain approximately 22.2 acres of open space. There will be various styles, sizes and types of parks located within Aloravita. Parks within Aloravita may contain certain of the following amenities: tot lots, basketball courts, picnic tables, ramadas, turf areas, concrete paths, tennis courts and restrooms. Aloravita HOA Parks will be approximately 1 to 2 acres in size and centrally located park space for all Aloravita residents. Possible locations of the HOA parks are shown on the Aloravita community open space plan. Aloravita mini parks will be approximately 2 to 4 acres in size and intended to create a central gathering place for all Aloravita residents. Aloravita pocket parks will be up to 1 acre in size and consist of small parks providing Aloravita residents outdoor recreation within their respective neighborhood. Aloravita neighborhood park, at approximately 10 acres in size, will be the largest park located within Aloravita and will serve as a gathering space for large community events. Aloravita homeowners associations shall maintain all parks located in Aloravita except for the neighborhood park, which the City of Peoria shall maintain. The HOA maintained parks (HOA, mini and pocket) may also serve as drainage and retention areas whenever needed.